Small farms are vulnerable to climate risk, but most smallholder farmers around the world don’t have access to insurance and other financial tools to manage fluctuations in climate. Over the past decade we’ve put a great deal of effort into a new kind of insurance–index insurance–that may have the potential to reach these farmers. Unlike more traditional forms of insurance, which require individual verification of losses, index insurance works by providing payouts when a measurable index flags a major problem that the farmers face, such as a widespread drought or flood. In theory, this should allow insurance coverage to reach many more farmers. 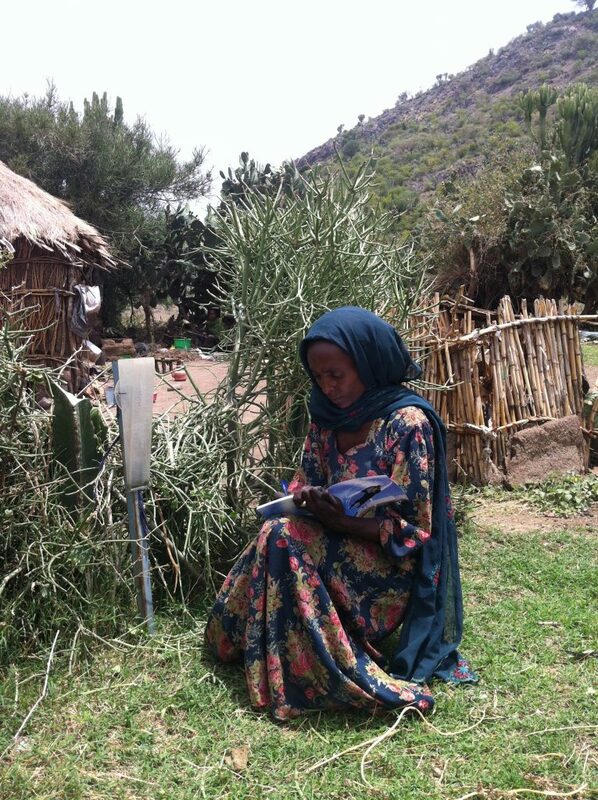 A farmer in Ethiopia records the rainfall collected in a rain gauge provided by the R4 project. At the International Research Institute for Climate and Society, researchers provide technical support to some of the largest and most successful index insurance projects across the Horn of Africa, individually protecting hundreds of thousands of farmers. In Ethiopia, for example, the IRI is supporting the R4 project, led by Oxfam America and the United Nations World Food Programme. R4 is also coordinating with key Ethiopian partners such as the Relief Society of Tigray, the Ethiopian National Meteorological Agency, and a team of NGOs, financial players, and government agencies. Sales began with a few hundred Ethiopian farmers in 2009, and the scaled-up R4 project now serves tens of thousands of farmers across many African countries. There are some major challenges, however, in further scaling index insurance across Africa. One key hurdle is identifying rainfall datasets that accurately reflect and substantiate the extreme weather that a farmer faces. In the index insurance business, payouts can only be provided in the years that are among the most extreme for rainfall (i.e. anomalously wet or dry). Insurance designers and companies require adequate rainfall data from previous droughts to analyze drought probabilities and calculate index insurance prices. This process is not only about measuring the rainfall in one particular year — local and high quality rainfall data going back decades are necessary to differentiate and compare anomalous and normal rainfall years. For farmers, it is important that critical droughts are not missed in the index being used to trigger insurance payouts. But in many areas of the world, quality rainfall data going back 15-30 years is nearly impossible to get. Rain gauges offer one solution to acquiring rainfall data, but most farmers do not live near a rain gauge. Even new rain gauges present some challenges in creating index insurance because they haven’t been around long enough to capture rainfall data from past major droughts. Satellites are another solution. Rainfall estimates from satellite data can cover a wide area, but their accuracy isn’t quite good enough to rely on them alone. However, by integrating satellite and rain gauge datasets, we can generate the necessary, comprehensive historical data from the last few decades. This is exactly what the Enhancing National Climate Services (ENACTS) initiative, led by IRI, has been doing. ENACTS is a unique, multi-faceted initiative designed to bring climate knowledge into national decision making by improving the availability, access and use of climate information. Scientists first improve the availability of climate data by combining quality-controlled data from national rain-gauge networks with satellite estimates for rainfall, elevation maps, and reanalysis products for temperature. Access to information products is enhanced by making the climate-related information products derived from the improved data available online through ENACTS ‘Maprooms’ – like this one for Tanzania. 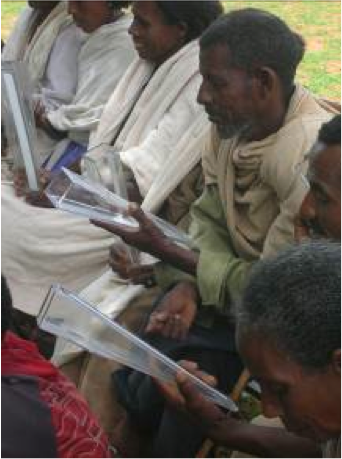 Farmers in Ethiopia receive rain gauges as part of a monitoring program with the R4 project. ENACTS was first implemented in 2009 in Ethiopia, and has since been initiated in Gambia, Ghana, Madagascar, Mali, Rwanda, Tanzania, Zambia, Kenya and Uganda. ENACTS has also been implemented at a regional level in West Africa in collaboration with the Agriculture, Hydrology, and Meteorology (AGRHYMET) Center and in East Africa via the IGAD Climate Prediction and Application Center (ICPAC). ENACTS and R4 were both born in Ethiopia at about the same time, and together have been overcoming parallel challenges in climate services. R4 presents an excellent example of how ENACTS is improving the use of climate information in Ethiopia – the project has relied on the unprecedented historical data that ENACTS provides to validate and design the insurance project. But the ability to monitor rainfall data during the growing season using ENACTS has also been a pillar of the R4 project, and one of the most practical uses of the ENACTS Maproom by insurers is to compare ENACTS data with rain gauges recently installed in villages. R4 has provided hundreds of farmers in the project with manual rain gauges – i.e. measuring cups mounted on a post – and each day or so the farmers report the amount of water in the cup. Because the farmer rain gauge information takes a month or so to be delivered, the ENACTS dataset is the fastest way to get rainfall data from local, ground-based sources. Farmers’ measurements from the manual rain gauges and ENACTS rainfall monitoring data (see animations below) are particularly useful in determining whether the rainy season warrants any action–an adjustment in production practices, for example, or the gathering of more information from farmers about their experiences These two datasets are also used to evaluate the accuracy of the insurance payouts as they rainy season unfolds. As previously mentioned, rainfall data from new rain gauges alone are not yet sufficient to understand if a modern drought’s severity merits a payout. But with the combined data, we can make comparisons between the magnitudes of current and past drought. This animation shows both the farmer reported rainfall data (blue) and the ENACTS data (yellow) over Ethiopia in 2014. It’s really cool to see the rainfall sweep across the area, what the different villages experience and how the story evolves by the time it is reported by the farmers on the ground. Given that one dataset come from someone going to a cup in a field and measuring, and the other comes from satellite measurements of clouds, we wouldn’t expect the datasets to exactly match each other. But for index insurance, it is important that the major rainfall patterns (and more specifically droughts) are evident from both datasets. It’s nice to see the beginning and end of the season and big rain storms, both of which are key for index insurance, agree between each other. In the past, these comparisons were made using weekly rainfall totals. But because farmers are now gathering daily rainfall data for validation and tracking, we now know which days the rain actually fell. When it comes to validating the data, the daily timescale makes it much easier to troubleshoot a data source – i.e. you can ask if it rained on specific days, compared to asking about total rainfall over a week. The newly incorporated ‘Daily Rainfall’ ENACTS Maproom page in Ethiopia, financially supported by the Department of International Development’s Weather and Climate Information Services for Africa (WISER) initiative, has taken seasonal tracking to another level and allows insurers to relate ENACTS daily rainfall estimates with farmers’ measurements across hundreds of villages. This animation uses the same data as the one above, but with a selection of a few weeks from July of 2014 and at a slower pace. You can almost get a sense of the personalities and schedules of the people reporting for the different villages — how often they visit the gauge, if a storm passed the night before or if a single day’s rain was not enough to be able to measure. The Agriculture and Climate Risk Enterprise (ACRE) insurance project in Kenya is another example of success in index insurance for which IRI provides technical support. Since 2009, ACRE has reached hundreds of thousands of farmers across East Africa, using technologies such as cell-phone based sales. Originally, the project relied on automated weather stations and the installation of dozens of private weather stations. As would be expected, one of the limits to scaling up was the restricted spatial extent of the weather stations. ACRE initially had an interest in working with the Kenya Meteorological Department (KMD), but the necessary tools were not in place for the massive amounts of data sharing and analysis needed to connect historical ground observations with gridded satellite projects. As a result, insurance companies began to independently use satellite datasets to scale up their services. Having better local and quality-controlled data would be extremely valuable to further improve the accuracy of these services. Fortunately, the WISER initiative supported IRI and KMD to launch ENACTS March 2017. Catalyzed by the ENACTS initiative, ACRE and other insurance companies are now starting efforts to understand how to utilize ENACTS datasets. The ENACTS initiative has truly been transformative—mobilizing the launch and scaling of some of the most successful index insurance projects that exist across Africa. These farmer-level projects index insurance projects are complemented by major innovations in country-level insurance contracts that have been purchased by national governments. Ethiopia was one of the earliest to explore this, and Kenya has bought into a more recent, Africa-wide product known as the African Risk Capacity (ARC). This insurance is bought by national governments across Africa, to help them manage large scale problems. The farmer-level and country-level products complement each other, not only in offering different scales of coverage, but also in validation, product design and scaling. For example, IRI is working with the UN World Food Programme to integrate ground-truthing and satellite technologies between R4 and ARC, with the ENACTS platform again providing the vital, high quality data to allow these projects to move forward. The current scaling of ENACTS is especially valuable as the farmer-level projects expand to new countries, and ARC’s national level coverage extends across Africa. Together, they could bring a new kind of integrated information and climate risk protection previously impossible.